Three articles in today’s NY Times well worth reading, with some excerpts below, explore the growing class divide between the private schools for rich children where real personalized learning is provided via small classes and computers are rarely used, as opposed to schools for middle class and poor kids, where ed tech is all the rage, pushed by corporate interests and fauxlanthropists like Gates and Zuckerberg. For those who want to see the presentation we did at last weekend’s NPE conference on this issue, including a video and power point, check out Outsourcing the classroom to machine learning & ed tech; why parents should resist. Is the explosion of ed tech in the classroom a massive hoax or a dangerous experiment on kids? Offer your comments below. A wariness that has been slowly brewing is turning into a regionwide consensus: The benefits of screens as a learning tool are overblown, and the risks for addiction and stunting development seem high. … Athena Chavarria, who worked as an executive assistant at Facebook and is now at Mark Zuckerberg’s philanthropic arm, the Chan Zuckerberg Initiative, said: “I am convinced the devil lives in our phones and is wreaking havoc on our children.”… For longtime tech leaders, watching how the tools they built affect their children has felt like a reckoning on their life and work. For the last six months, at night in school libraries across Overland Park, a suburb of Kansas City, Mo., about 150 parents have been meeting to talk about one thing: how to get their kids off screens…. It could happen that the children of poorer and middle-class parents will be raised by screens, while the children of Silicon Valley’s elite will be going back to wooden toys and the luxury of human interaction…. The new five-year capital plan for schools for 2020-2024 is expected to be released next month. Earlier this week, a letter was sent to the Mayor de Blasio and Chancellor Carranza, asking them to fulfill the promise the Mayor made last year that the new plan would fully fund new school space according to the Department of Education’s own estimate of need. At that time, the need was projected by DOE to be 38,000 seats in addition to the 44,000 seats in the current plan, to alleviate school overcrowding and accommodate projected enrollment growth. The letter was signed by Public Advocate Letitia James, Manhattan Borough President Gale Brewer, newly-elected State Senator Robert Jackson, along with leaders of the Chancellor’s Parent Advisory Council, many Presidents of President Councils and Community Education Councils, the Education Council Consortium, and Class Size Matters. The letter also urged the Mayor and the Chancellor to accelerate the process of school siting and construction so that the additional seats are built within five years, rather than trailing years behind enrollment, as occurs now. A copy of the letter is posted here. Melissa Tomlinson and Marla Kilfoyle of the Badass Teachers Association along with Rachael Stickland and Leonie Haimson presented the new Educator Toolkit for Teacher and Student Privacy at the Network for Public Education Conference in Indianapolis last Saturday, October 20, 2018. Check it out below. Since the Toolkit was released on Thursday Oct. 18, it was covered in Ed Week and has been downloaded more than 2000 times! You can download the entire toolkit yourself at https://bitly.com/PCSP_EducatorPrivacyToolkit. For more on the lack of attention given to class size in the UFT contract, see the commentary from MORE, the UFT progressive caucus, and from James Eterno, long-time teacher leader of the ICE, the Independent Community of Educators. “Beutner’s proposal does nothing to make our schools better. This is an insult to our members, to our students and to our parents,” said Arlene Inouye, Chair of the Bargaining Team. “This stunt reveals he is more interested in fighting against educators at any cost than saving our school district.” An oped about the fight for lower class sizes in LA schools is here. Meanwhile there are no moves to lower class sizes in the new proposed UFT contract, with caps that have remained the same for nearly fifty years. The existing caps remain far too large at 25 students per class in K, 32 in grades 1-5; 30-33 in middle schools (depending on whether it’s a Title One school), and 34 in high school. When the UFT first became the teachers’ bargaining agent in 1961, lowering class size was already one of the union's top priorities. The specific demand submitted to the NYC Board of Education that year was that all classes should be capped at 30, with classes of struggling students capped at 25, and special classes limited to 15. In 1963, the first class size caps were first imposed, along with higher salaries, under the leadership of Al Shanker and the threat of strike. In 1964, these caps were reduced and even smaller classes were instituted through the contract in a select group of schools in disadvantaged neighborhoods, called the “More Effective Schools." These schools capped class sizes at no more than 22 students and also offered preK classes limited to 15 students, in a visionary program, truly ahead of its time. The schools also provided "teacher specialists, grouped classes heterogeneously and emphasized school-community relationships. A $5 million fund was dedicated to be spent on these schools as well as other “intensive” programs, and a “work group” made up of the UFT, the BOE and parents would “make appropriate studies and to submit recommendations” to the BOE on how the program would be expanded. A 1967 independent study found exceptional gains in these schools, which enrolled 18,000 students. The schools offered an average class size or 20.5, more than 8 students fewer than the citywide average. Improvements were noted in student achievement, speech fluency, school climate, and survey responses from parents and teachers and administrators. “Standardized test results in reading and arithmetic show favorable gains in ability and skills by the More Effective pupils, whether or not they are compared in growth with national norms or with a comparable control group of schools.” The study also found that significantly fewer teachers transferred out of these schools than the city average. In 1970, a consultant concluded that “The program’s major objective was realized to a considerable degree, especially in instilling in the pupils a desire for learning, a likely for school and increased respect for themselves and others.” When the Board of Ed cut funding and discontinued these schools in 1972, the UFT unsuccessfully sued in Brooklyn Supreme Court keep them going. Since that time, the evidence on the importance of class size to improving student achievement, school climate, student engagement, disciplinary problems, graduation rates and teacher attrition has only grown. Yet not only have class size caps not been reduced, they have actually been increased in recent years. Starting in 1986, class sizes were capped at 28 in grades 1-3, because of a UFT “side agreement" or sometimes called a “capping circular,” created with special funding from the City Council under then-Speaker Peter Vallone. When the DOE began to ignore this agreement in 2010 and raised classes to 32 in these grades in hundreds of schools, it provoked very little protest from the union. An archived page from 2011 on the UFT website acknowledged these lower caps, missing from the current page dealing with class size caps: When specific funding is provided, as has often been done for the early grades, lower caps may apply. In recent years, 1st and 2nd grades have been capped at 28 students per class. Ask your UFT chapter leader if lower limits apply to your class. In 2015, Chancellor Carmen Farina instructed principals to ignore the class size cap in Kindergarten, probably the worst grade to allow this to happen, according to research. The UFT belatedly responded by agreeing that in a class that exceeded 25 students, the teacher would receive an extra prep period or a classroom aide assigned to the classroom for part of the day. Neither of these measures took effect until after December in 2015, far too late into the school year, and neither would be expected to provide the same benefits to students as a small class. In recent years, too often the resolution for class size violations in other grades as well has been to award teachers an extra prep period or some other concession – with no benefit to the 35 plus students in their classes. In 2016, the DOE and UFT created a labor-management committee to focus “on resolving overages in schools with a history of oversize classes”. At the time, it was claimed that this would lead to the speed of addressing class size in schools in which class sizes violate the limits year after year, without any resolution for months at a time. Under the new process, remaining oversize classes that the superintendent and the UFT district representative cannot resolve by day 21 will be turned over to a class size labor management committee. That central committee will meet at least three days a week every week until it has reviewed the remaining oversize class issues in every school. The new process is different for a “chronically out-of-compliance” school — a school that has had oversize classes for four or more of the last six years, including the most recent year. [emphasis added] The central committee will meet no later than the 10th day of school to determine a school-specific solution for each of these schools. The central committee will reconvene in June to update the short- and long-term plans for each of these schools to head off trouble in September. Schools for which the central committee fails to find a solution will be fast-tracked [after months have already passed?] to arbitration. Under the new process, the arbitrator will have the authority to determine the appropriate remedy. Meanwhile, according to the contract, any resolution to address violations in schools with chronic violations, as well all discussions in the Class Size Labor Management committee “are non-precedential, and the parties agree that they will not be used in any other forum or proceeding except to enforce their terms.” This implies an untoward level of secrecy for an issue with such importance to parents and students. 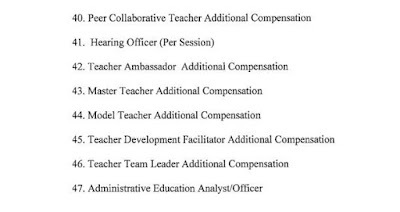 These new higher-paid positions are also supposed to reduce teacher attrition at these schools, but there is little or no evidence that supplementing salary will work – as opposed to reducing class size, which has been shown to improve teacher retention rates in many studies, including as noted in the research on the More Effective Schools. “David Bloomfield, an education professor at Brooklyn College and the CUNY Graduate Center, expressed surprise that the UFT agreed to differential pay for teachers in different locations. He also stressed that salary issues were not often at the forefront of teacher’s concerns in high-need schools and districts. A teacher with the initials JTS left this comment: Agree with the final comment. Working in a tough school can be a completely different job than in a school with few problems. Its not worth your sanity for an extra $5000-8000. They should increase that amount or better yet, change working conditions, such as by reducing class sizes or having more effective discipline and support systems in these hard-to-staff schools. The Renewal schools, the previous program for struggling schools which the previous Chancellor Carmen Farina created has had inconsistent results. As part of a $4.9 million teacher-leadership program, these schools were provided the opportunity to raise salaries by $27,500 for top teachers willing to take on leadership roles; yet a Chalkbeat investigation found that nearly 40 percent of teachers at schools in the Renewal Program in 2014 had left after two years. 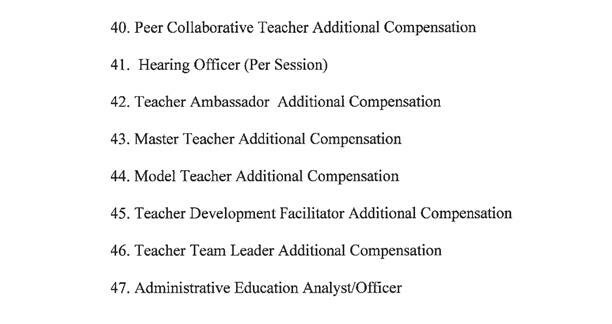 According to the new UFT contract, the Bronx Collaborative schools will not only be offered new categories of higher paid mentor teachers, but will also “priority consideration for centrally funded initiatives such as Equity and Excellence initiatives, air conditioning, physical education and others that align to the schools' goals. " But apparently not class size reduction, which would give them the greatest opportunity to engage their students, leading to more learning and better outcomes. Our analysis of Renewal schools showed that the ones with the smallest classes were most likely to succeed. In a UFT teacher survey from 2013 – the most recent one publicly available - 99% NYC teachers responded that class size reduction would be an effective reform to improve NYC schools. About 90% said that this would be a “very effective” reform – far outstripping any other proposal. If the UFT leadership was doing anything else to push for smaller classes, either through court action or advocating for targeted funding for class size reduction through the state or city budget, their lack of attention given to reducing class size in the contract would be more understandable. Sadly, for too long, they remain Missing in Action on this crucial issue. The below testimony on school busing was submitted to the City Council by an Inwood parent with an autistic daughter who prefers to remain anonymous for the purpose of preserving her child’s privacy. she is commenting on Int 1099-2018, a bill to be discussed today at Council hearings requiring tracking devices on all NYC school buses. Thank you for taking the time to read my testimony. My name is [removed]. I am a parent of a elementary school-aged child with an IEP in District 6 in the Inwood neighborhood of Upper Manhattan. I have intentionally left her name and diagnosis out of my testimony to protect her privacy. Please help guard her privacy by referring to me and my testimony by my middle name, Nicole. 90 minutes for in borough and 180 minutes for out-of-borough transportation. 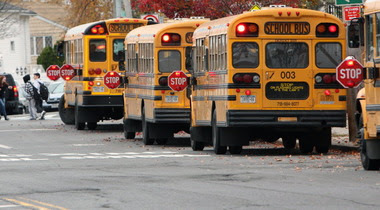 Given a 6 hour school day, this means that a child may spend 40% of his or her school day actually in transit on a bus. It is thus a vital part of a students learning experience. The proposed ‘school bus tracking app’ could be very beneficial to many students and their parents if implemented conscientiously. It is my personal experience that the $40 ($75) initial investment in Verizon’s LG Gizmo Pal 1 (now 2) plus $5 monthly charge have enabled my child to have the benefit of this proposed legislation. It uses both GPS and cell-phone tracking to allow me to check my child’s progress to and from school. This tool has kept my mind at ease those days when her in borough route has stretched into 100 minutes or longer — no crash, just late. It has flagged the days when the bus got her late to school, and she missed out on vital learning time. It has illustrated poorly planned, inefficient routes. It is a tool that should be available to all parents. I hope this legislation will provide an opportunity to improve school transportation for all students. (1) GPS is too narrow of a definition for a bus tracking device. The technology for this type of tracking device can be challenging in a dense metropolitan area such as New York City. I suggest requiring the tracking device to have at least 2-fold technology: 1:GPS as well as 2:GSM/CDMA (cellular phone triangulation). Moreover, the legislation should be written in such a way as it ‘grows’ with the technological standards for tracking. (2) It is not clear who the owner of the cellular phones referenced in Int1099-2018. The mandate should clarify that these are owned by NYC DoE, and the hardware used / software installed should be highly regulated. (3) The protocol for use of cellular phones / radios by bus drivers should be clarified. Is it permissible to use these while driving? Only while stopped? Are these intended for the bus matron instead? (4) There is no explicit treatment for how the data gathered by these tracking devices will be protected from unintentional distribution (hacking) or regulated/prohibited for intentional distribution (3rd party data sharing by NYC DoE, OPT, busing companies). Will students’ privacy be protected? (6) There is no protocol for how the data will be used to improve student transportation: *Will too-long (out of IEP compliance) routes be flagged automatically? *Will ‘lemon’ buses (those with chronic break-downs) be flagged automatically? *Will drivers be penalized for speeding? *Will drivers be penalized for waiting an extra minute when a child has trouble transitioning onto the bus? *Will the efficacy of the route be assessed and poorly designed routes flagged for improvement? *Will adjustments be automated for predictable traffic conditions (i.e., garbage pickup times on narrow streets)? *Will there be an automated process to give students ‘make up’ time when the bus is late getting the student to school? *Will special education students continue to be segregated from non-special education students during transportation? (Will they be allowed to integrate with supports?) Or will there continue to be dual, segregated routes? I do hope that you can incorporate some of these suggestions into the current draft. I also note that, if transportation is required to adhere to the IEP guidelines wrt limited time transportation that NYC DoE may be compelled to operate schools in more wide-spread locations. I think that this change would also benefit many students.